The following tool estimates the total number of tiles necessary to cover a floor, roof, wall, or any other surface. 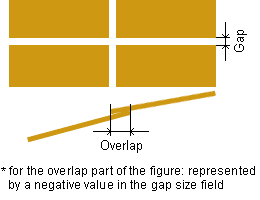 It also considers the gap or overlap between tiles for better accuracy, as shown in the figure below. Gap Size: inches cm mm feet meters yards tile grout spacing, use negative value if overlaps. Floor or wall tiles are typically installed with gaps between the tiles because the average tile may look quite similar to the next tile, but they are often not uniform in shape and size, and would not fit properly if installed without any gaps. These gaps are most commonly filled with grout, and as such, are often referred to as grout size, or grout lines. Grout is a form of concrete, and the gap between tiles can range from anywhere between one-sixteenth of an inch to half an inch in size. Different sized tiles, materials, and design needs all affect the size of the gaps. Although it is typically more difficult to have small gaps between tiles due to lack of a uniform shape and size, the use of rectified tiles (tiles that undergo additional processing to ensure that they are uniform) can allow for smaller spacing, though at an additional cost.1 For more uniformly cut tiles such as granite, smaller grout spacing can result in less visibility of grout lines between each tile. In some cases, such as with roofing tile or the wood siding of a wall, rather than having a gap between them, tiles overlap to prevent leakage. The roofing calculator can account for both of these situations. Either enter a positive value to if there is a gap between the tiles being used, or a negative value if the tiles overlap. Tile size can range anywhere from smaller mosaics that are 3/8", to 24" × 48" slab tiles and everything in between. Square sizes (same width and length) are the most popular, accessible, and easiest to install. While straight edge tiles (rectangular, square, parallelogram) are most common, unique tile shapes also exist, though installation is not as easy. Large tile sizes can make smaller rooms appear bigger, as well as more open and clean because there are fewer grout lines. However, installing larger tiles results in more wastage, while using smaller tiles can help add texture to a room. There are a number of different classifications of tiles including ceramic, porcelain, glass, quarry, and stone. Ceramic and porcelain tiles are the most cost efficient, and come in a variety of different styles. Glass tiles, while not appropriate for flooring because they crack under pressure, are visually unique and interesting; they are most commonly used for kitchen and bathroom backsplashes. Quarry tiles have rough surfaces that are good for floors that require grip, and are commonly used outdoors and in restaurant kitchens. Stone tiles include marble and granite, which provide unique and natural stone patterns, textures, and colors that are difficult to achieve using ceramics. They also offer the illusion of blending into grout edges, giving off an overall uniform look. There are many different patterns used when installing tiles. The most common pattern used is a linear grid, with square or rectangular tiles, or a pattern involving angled squares or rectangles that form a typical diamond shape. Running bond layouts (like those used with brick walls) involve offset rows or columns of tiles, usually with a 2:1 length to edge ratio. Running bonds generally use about 10% more material. Herringbones involve aligning tiles in angled patterns, usually 45 or 90 degrees. Similar to running bond layouts, herringbone layouts use more material than linear layouts. Nealon, Gary. "Grout Lines: How to Determine What Size Grout Line To Use." https://www.rtacabinetstore.com/blog/grout-lines-determine-size-grout-line. Wallender, Lee. "Types of Tile Materials You Should Know." https://www.thespruce.com/types-of-tile-materials-to-know-1822194. Home Flooring Pros. "Tile Sizes and Tile Shapes for Your Floor – Buyers Guide." https://www.homeflooringpros.com/blog-guides/tile-sizes-shapes/.